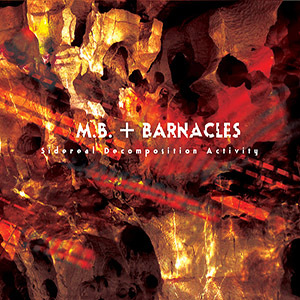 Brainwashed - Barnacles, "Air Skin Digger", M.B.+Barnacles, "Sidereal Decomposition Activity"
Barnacles, "Air Skin Digger", M.B.+Barnacles, "Sidereal Decomposition Activity"
Barnacles, the (mostly) solo project of Italy’s Matteo Uggeri (also a member of Sparkle in Grey) has released two albums nearly simultaneously, and even though the approach to each are drastically different, the final product is entirely complimentary. With one culled from source material of previous releases and the other with the legendary experimental Italian artist and composer, there is a wide gamut of sounds here, but one that has the unified focus of Uggeri’s compositional skills. 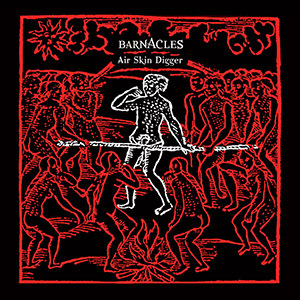 Air Skin Digger is the self-plunderphonic of the two: four lengthy pieces of complex, interlocking loops that are created exclusively from Uggeri's other projects with no other instrumentation included. Per composition there are also only four source sounds used. Even with these self-imposed limitations, the final product sounds far more complex and diverse. Opening piece "How a Slave, Who Had Perpetually Defamed Me and Desired to Have Me Killed, was Himself Killed and Eaten in my Presence" leads off with noisy loops and far off bagpipes (performed by Alberto Carozzi) that are cast atop a nicely drifting, echoing backdrop. Soon frenetic drum loops, originally recorded by Simone Riva, are added and the piece takes on a chaotic, but brilliant direction. Comparatively, "Of the Manner in Which the Savages Ate a Prisoner and Carried me to the Feast" is a bit more electronic sounding, and also more rigid. Synth sequences and guitar loops make for a tighter structure, eventually relenting with the inclusion of 4/4 kick drum patterns and what sounds like tapes from a riot. For the second half things loosen up as more drumming from Riva and distorted noise loops take focus. The final piece, "My Prayer to the Lord God When I Was in the Hands of the Savages Who Threatened to Eat Me," is a fitting climax, throwing a bit of everything together and it all solidifying amazingly. Franz Krostopovic's viola is mixed clearly to the front as Uggeri blends in some industrial sounding drum loops to contrast. The mix is great, joining in the slow, ambient passages with more aggressive rhythms. After an ambient breakdown he reintroduces those original sounds with the addition of actual drumming, ending the album on a strong note. For Sidereal Decomposition Activity, Uggeri works from a wider palette with newly created sounds, alongside contributions from the legendary artist Maurizio Bianchi. 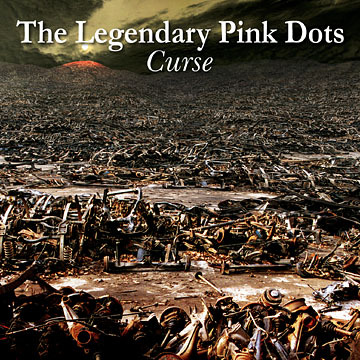 The two have collaborated at various times since 2007, so it is no surprise that their unique styles end up complementary, with Uggeri focusing on the rhythmic and chaotic sounds, and Bianchi, in full new age mode, leaning heavily on the synths and electronics. "Infinite Cosmic Eruption" opens the album with Uggeri’s noisy, loop-heavy din. The rhythms are there but more processed and sparse compared to his solo material. Bianchi contributes some spacious, droning electronics that nicely fit with his current work, but still the final product feels faithful to his classic material as well. This nod to classic M.B. is especially prominent on "Sidereal Decomposition Activity," with its wobbling distortion and Bianchi's decrepit, decaying keyboard passages. The dour, bleak electronic sound is the focus, as Uggeri's rhythmic loops are subtly blended in and out, at times taking the stage more aggressively but never as to overshadow the electronics. "Astral Fall Dynamism" is a bit more disorienting in its distant mangled voice loops and plucked string patterns. The result is an abstract, less structured piece of material. Concluding song "Unearthly Armagheddon Energy" takes the album out on an especially strong composition. From its noisily static opening and depressive melody, the two pile on the sounds, rhythmic and processed, coming together as almost song-like and traditional, but in their distinctly idiosyncratic way. Building to a dramatic crescendo and then stripped back like the post apocalyptic fallout after a cataclysmic explosion. Matteo Uggeri’s loop-heavy, abstract sound sculptor approach to music as Barnacles nicely ties these two records together that, in some ways differ greatly from one another. With Air Skin Digger being limited to just treating and remixing previous works, and Sidereal Decomposition Activity having major contributions by Maurizio Bianchi, the two albums start from notably different concepts self-imposed constraints. While the two may not sound entirely similar, Uggeri's style leads to a synergy of sorts, resulting in two distinct albums that are both essential and complementary to one another.